Sad news that Norman Wisdom has passed away today. Thanks for the laughs Norman rest in peace. Just saw the news on TV. Another wonderful former guest at Autographica. Again, just like with Tony Curtis, this shows how important the show is for bringing us these true legends. As well as Autographica, I was lucky enough to see one of his last ever stage appearances when he was at the Derngate Theatre in Northampton. I'll always remember the Q and A part of that. Sir Norman just lit up, full of life, as he interacted with the audience. Really thriving on the love for him that was clearly there from everyone. One of the oldest stars I've ever seen on stage, but at that moment he was more alive than people a quarter of his age. Truly amazing. Something I'll never forget. RIP to a legend who will always be loved. Met the great man, about 15 years ago, at a book signing in Epsom. A kinder, funnier more gracious person, you could not wish to meet. 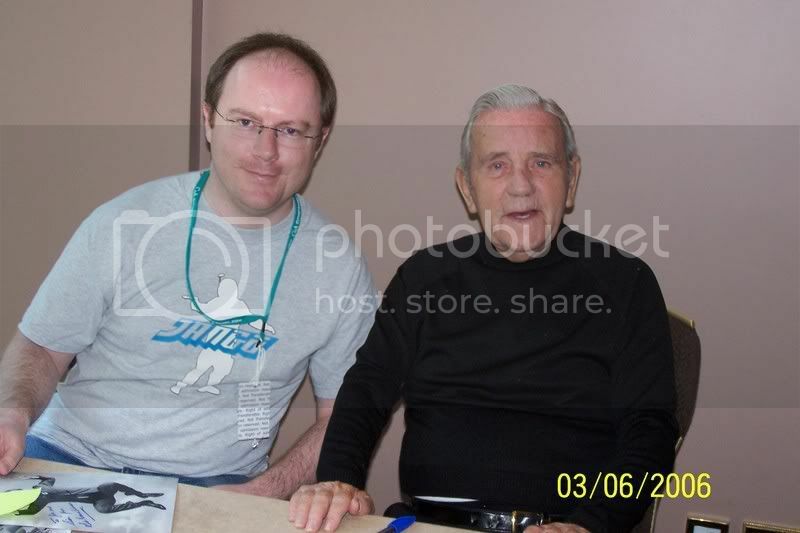 One of my favourite ever meets was Norman Wisdom at Autographica a few years back. Even then he absolutely delighted in an audience and was very entertaining. A true legend. A man that brought laughter to so many people all over the world, not least in Albania ! A regular at our local charity golf tournament throughout the 90's - a national treasure. Sir Norman Wisdom died in a Ballasalla nursing home at the age of 95 on Monday evening, sparking tributes from around the world. His funeral will be held later this month, and could bring Douglas on the Isle of Man to a standstill as his cortege travels along the promenade. Although his family and friends will be holding a private burial ceremony, a spokesman says the whole Island is welcome to attend a service and reception. Mourners will be able to pay their respects to Sir Norman on Friday, October 22. A horse-drawn hearse will leave the Onchan end of Douglas promenade at 1.35pm, before travelling into the town centre. There will then be a service at St George's Church starting at 2pm, followed by a reception to be held at Sir Norman's Bar, at the Sefton Hotel. Both the service and reception will be open to the public.